I'm going to play in the Hartlepool Chess tournament this weekend; It's a typical 5 round English swiss tournament, 1 round on Friday evening, 2 on Saturday and 2 on Sunday. Hartlepool, for those of you who don't know it, could be regarded as England's answer to Springfield: It has a nuclear power station and recently elected a guy dressed in a monkey outfit as its mayor (it's a long story going all the way back to the Napoleonic wars). Its football team has just won promotion and the pies at Greggs are always hot. The tournament venue, an upstairs function room at a hotel / bar in the centre of the town, is one of the most crowded, hot and uncomfortable you could find, but the quality of the competition is usually good. I finished second there a couple of years back, walking away with a decent cheque after watching all the other last round games finish favourably for me. Having said that, the cheque bounced! In fairness, it did clear a week later. 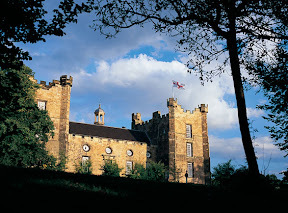 I'll be 'preparing' for the event by attending a conference on Friday at Lumley Castle. I might also be revising some opening lines. Lumley is one of those dream hotels, with bedrooms scattered throughout the Castle. It has fantastic views over a new International cricket ground; when the visiting Australian cricket team stayed they apparently resorted to sleeping on each other's floor because of fear of the ghosts... how on earth did we lose to them!